168 pages | 7 B/W Illus. 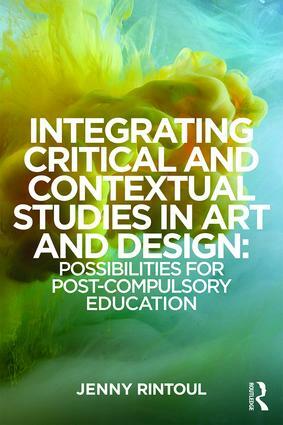 Integrating Critical and Contextual Studies in Art and Design examines the relationship between two aspects of art education that appear at times inseparable or even indistinguishable, and at others isolated and in conflict: Critical and Contextual Studies (CCS) and studio practice. Underpinned by international contexts, this book is rooted in British art and design education and draws upon contemporary case studies of teaching and learning in post-compulsory settings in order to analyse and illustrate identities and practices of CCS and its integration. suggestions for integrating CCS in art and design courses, including implications for pedagogy and assessment. Integrating Critical and Contextual Studies in Art and Design offers a comprehensive analysis of the current drive towards integration within art education, and elucidates what we understand by the theory and practice of integration. It explores the history, theory, teaching and student experience of CCS, and will be of interest to lecturers, teachers and pedagogues involved in art and design as well as researchers and students of art education. Jenny Rintoul is a senior lecturer in Visual Culture at the Faculty of Arts, Creative Industries and Education, University of the West of England, UK. She has previously worked as a dancer, a gallery educator and a Further Education (FE) teacher of Art and Design and History of Art. She has taught Critical and Contextual Studies across a range of FE and Higher Education (HE) programmes within Performing Arts, Musical Theatre and Art and Design.